It is hard to believe that three years have passed since our first AgEnders conference. In that year, AgEnders, Americans against UN Agenda 21, have formed a nationwide network with many and all like minded groups. Our nationwide network has exploded as we bring Americans the education they were missing in order for them to make the right decisions about the future of America. Just as we have learned in the past, once Americans know the truth, they will make the right decisions. This could have not been done without coordinating with the experts who have spent years carrying the message of the deceit, lies and corruption which are being waged against them, only to be discounted and disgraced. We thank you for never giving up. As a result of your efforts, AgEnders have been able to inform, educate and act. Today as we realize that too often the people we trusted, lied, stuck the knife in and twisted all so they could destroy in the name of money, power and control. They are the Right, the Left, the R’s and D’s, the ISMS, the self proclaimed elite, the power brokers in government, corporations and the United Nations. They represent about 10% of the world’s population. We know they have stolen all of the money. Now they are after power and control. They are smart and have promoted both sides of wars, depleted food sources, enslaved masses, ignored disease all in order to control populations. We know their goal is the destruction of America, God, Morality, Family - the World as a whole. They say it often enough. Today we know their deepest fear is Americans. They may have all of the money, they may try to erode our God Given Rights but they can only have power if we give it to them and so the buck stops here. “ When injustice become law, resistance becomes duty.” Thomas Jefferson. 70-80% of Americans are awaking up. Only this time it is different. We have our sneakers on, not bags on our heads. Americans are finished with divide and conquer. Americans know the spin game and we are not playing any more. Little by little, piece by piece, Americans are engaged. It started with cities and counties bowing out of ICLEI, Resolutions and Bills throwing out the UN Agenda 21. But the elite continue to entangle and pay out our hard earned $$ to the very corruption that is intent on destroying us as a country. 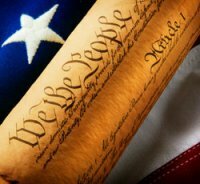 Americans have chosen the US Constitution over international law. Americans are unhappy with the Elite chosen path which will lead to destruction and renewed slavery for our children. Instead we choose George Washington, Thomas Jefferson, Benjamin Franklin and all the others and we will resist, one special, exceptional American at a time, coming together. No we will not give you the power and control. "We The People" will retain control of the greatest country on the planet. We know you want to steal our land, our natural resources, our equity and our minds. We know you have used our laws and generosity against us. But our Freedom, Liberty and America is not for sale. Evil has already given away most of our national parks and monuments along with valuable resources. In ​1972, our government signed the United Nations' World Heritage Treaty, a treaty that creates "World Heritage Sites" and Biosphere Reserves." Selected for their cultural, historical or natural significance, national governments are obligated to protect these landmarks under U.N. mandate.1 Since 1972, 68 percent of all U.S. national parks, monuments and preserves have been designated as World Heritage Sites. We are many; they are few. We have all the numbers. They will never buy our votes in order to enslave us, so they steal them. The only way they will have power is if we give it to them and we will not. Our Founding Fathers were brilliant men suffering from the same issues we have today. The Federalists wanted bigger government with more powers and the Anti-Federalists wanted the power in the states. Together they compromised and created some of the greatest documents in the history of mankind, the Declaration of Independence, US Constitution, Bill of Rights and the Federalist papers. All together they show our rights are granted by God our creator, not the United Nations or individuals like George Soros, Rothschild's or Rockefeller's and their buddies. The first way to become whole is to recognize the problems. So let us all take a look in the mirror because we have all had a hand in this mess. We must stop blaming others, although it is not all our fault. It doesn’t matter whose fault it was, it only matters that we learn from the mistakes, correct them and stop them from happening again. We have all been lied to, cheated on and stolen from. Either we can stay in this rut of distractions by continually blaming someone else or we recognize our failings and take responsibility and act. 70-80% want to act. Action requires a commitment. What are you willing to give up? Will you pledge your Life, Fortune and Sacred Honor as our founders did? “If to please the people, we offer what we ourselves disapprove, how can we afterwards defend our work? Let us raise a standard to which the wise, and honest can repair. The event is in the hands of God.” George Washington. There is no more turning away from the responsibility to act. So let us re-learn what makes up America and together form the biggest group in the world, a group that can never be divided, Americans! America is the richest land mass in the world. It contains every item needed for survival without dependency on any other nation. Americans own America and therein is the problem. According to the US Constitution, Americans have rights to own their equity – personal, business and land. Americans can accumulate wealth. They can own what is above and below their land. The fight to retain ownership of that equity is the reason for the conflict. Evil wants to control the people, their wealth and their land claiming that the wealth and land (equity) belongs to all equally and it is their role of government to control that equity by deciding who gets what. Our founders recognized that as tyranny waged and the Revolutionary War was fought over that control. Our Founders recognized that Freedom and Liberty were not negotiable. The Declaration of Independence severed the ties of America declaring Americans as a Free and Independent people. Americans were free from the oppression of the dictatorial rule of tyrannical King George of England. Evil is removing that bit of history from history books so our children, young Americans,do not understand the value of their heritage and citizenship. Evil knows that a man without a heritage can be easily be led. Therefore, school lessons focus on American history after 1865. Americans who have no understanding of freedom and liberty will not miss what they don’t know. Re-read the Declaration of Independence and you will be shocked at the similarities of the 1700’s and today. Very little has changed. Evil still wants to control the people. Evil recognizes if the people are continually "dumbed down" they will require less and less and therefore they will get less and less allowing evil to get more and more. Our Founders recognized that if Americans were given the right tools of education and each had the opportunity to become exceptional, exceptional Americans will group together and create exceptional things. As a result of their wisdom, American have created more wealth and good for humanity in its 235+ years of existence than any other country in the world. Today every human on earth benefits from some American invention. In the early years, immigrants came to America specifically to gain freedom from religious persecution and seek their fortune as free individuals. They learned English for two basic reasons. English is the language of business. Without learning English, a person will be signing contracts that are left to the interpretation of another, maybe without your best interest. Evil knows without the ability to read and write English, people can easily be divided. Lies and fear can easily be initiated. Divided We Fall. Evil knows that if multiculturalism is promoted, and the people stick to their ethnic or religious group the country will forever be divided. Divided people will never group together for the one purpose of fighting evil and in the end, to have preserved their country, America. Like minded ethnic groups who stick together. will deny America as their home and their home country will always take priority. As citizens, Evil knows by creating a crisis, Evil will influence Americans to give away America, since their allegiance is to a different motherland. In the months and years ahead, many groups will come forward with solutions. It is imperative that we first work within our states. The US Constitution grants the majority of the power to the people through the states. (Amendments 9 and 10). The states must remain whole and eliminate the overreach of the Federal Government. We all know the Federal Government lies and is on a crash course to increase in size and squeeze the life out of We the People. Yet, knowing and acting are two different things. It is now time to act. First we must become educated and then we can educate others. We must end political correctness and the idea to never talk about religion or politics. Those concepts were designed by Evil to create censorship, not discourse. We must understand that what comes from the government and the media is usually a lie to benefit government and special interest. Yet we must be informed. Truth will always prevail. Today it is easier to find on line. We must learn the truth and at the same time our children must be educated and know the truth. And we must stop depending on the Federal government to provide us with our every need and at the same time, hold them accountable by knowing who you are voting for. We have judges believing they have the right to write the law and make decisions according "to political ideologies. George Washington warned against political parties stating they would eternally cause a divide in the country through the "ego's" of men - and he was right. American's looking at the truth of things, must realize there is no difference in reality in the 2 main political parties. Americans should be voting for the person, know their background and if elected and do nothing, or become questionable, remove them. It is the responsibility of Americans to preserve their country by taking care of it. I know most families have 2 parents working, but would you rather be taking care of your families as those coming to this country in the 1600's. Evil would like to put you there with nothing - no jobs but for money for them - no land - no wealth of your own - nothing! We The People can not win if we are not engaged. We the People can not be engaged if we are not educated in the truth. Continue to learn the truth. Do not be fooled America! Yes we elected a man President who is not considered a Politician, but he is surrounded by Politician's. We must keep a watchful eye - know what kind of laws are being passed and why; why agreements are being made with the United Nation; and who the people behind the scenes are that are really controlling our country. It is "We the People" who need to regain their power and hold those we have elected accountable for their work performance or lack of. On this site you will learn the history missing from our schools. Learn why the pieces don't fit or make sense. Learn why we are in the state we are in. Most importantly, you will learn what it is to be an American and why we must NEVER give away our Lives, our Liberty and our Sacred Honor.